Around 1899 or 1900, however, she and some of the other girls went to Nevada after the troop was disbanded (never having been called upon by the military). Trained as soldiers, and feeling their oats, the gang ranged the country side as vigilantes, although they garnered a reputation as being almost as bad as the criminals they pursued. It was around this time that Hernandez earned the nickname "the Desert Hare" for being a dusty, crafty, fleet-footed nuisance. In 1905--after an incident that the usually outspoken Hernandez refused to speak about even later in life--she fled alone to Mexico. She spent the next few years in flophouses, leading a generally rough and miserable existence. Sometimes working as a gun for hire, often to gold prospectors seeking protection from locals as they hiked into the mountains, Hernandez occasionally made ends meet. 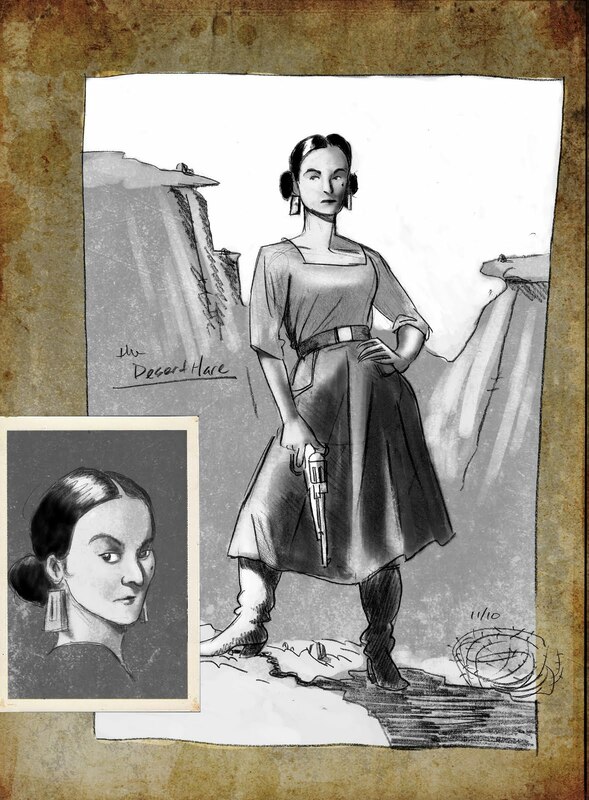 Around 1908, Hernandez met fellow ex-patriot 52 year old Constance Jackdaw, an eccentric tough-as-nails lady-explorer and anthropologist. The older woman had traveled Central and South America extensively, on archeological expeditions, lending her expertise to anyone who would hire her. Jackdaw took Hernandez under her wing and gave the brash, intelligent, but semi-illiterate youth an education. The two spent the next decade getting into misadventure after misadventure. In all their deeds, the ladies skirted the lines of legality, and certainly crossed the lines of contemporary social boundaries. Together they gained quite a reputation. By 1922 Hernandez's life had changed dramatically. Having found time to attend university, she held a Doctorate in Pre-Colombian Art and Archeology, and led a somewhat settled life in San Francisco. She found work as an editor on an Archeological Magazine titled Pleasure of Ruins. Despite her settled life, her spirit and personality demanded she lead a double life of excitement, and at 39, she still adventured extensively. Often while editing the magazine, far off locations called to her and she would drop everything to fly off to meet adventure face to face. She often traveled with Jackdaw, then aged 66, along with their fellow explorer, self described "salty old jungle archeologist" Beto Benavidez. Together, the three regularly flung themselves into the wilds, chasing the ghosts of the long forgotten past, and tangling with gunslingers, bandits and grave-robbers of every description.